Bugera Amps are pretty new on the scene, but they're making a big splash on the tube amplifier world. They've made a point to introduce different guitar amps that are designed to handle your chosen style of rock, from vintage or classic rock to alternative, punk and metal. 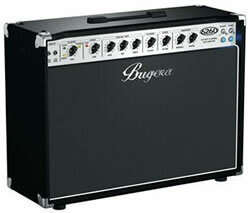 Bugera Amps is a division of Behringer, which makes a ton of audio gear for recording and performing. Behringer has always offered lower cost alternatives to that of other manufacturers of audio equipment. Up until they began building all tube (or "valve") amplifiers under the Bugera name, all the Behringer amps were solid state/digital modelers. In 2008, Bugera Amps started showing up in magazine reviews and at industry conventions. There was concern early on by musicians that because these are "Behringer" products, the amplifiers would be cheap copies of more well-known amplifiers like Peavey and others. True, just by looking at the cosmetic design of the models, you can see the influences of other manufacturers. For example, the 1960 head looks similar to a vintage Marshall head. The 333 and 333XL are similar to a Peavey JSX or Mesa Boogie Dual Rectifier. The big difference you'll notice is in the pricing. I own the Bugera 333 head and 412H-BK cabinet. I've found it to be comparable to a Mesa Dual Rectifier in tone (yeah, I know, it's not exact), and managed to get the whole rig for right around $750. I can't touch a Dual Rec head and cabinet new in the US for less than $2700. So the Bugeras are a great start for the tone and money! Turns out these guitar amps are winning lots of people over. There have been numerous good reviews coming out on the web and in magazines. Bugera has also had good showings at the industry conferences like NAMM and Musikmesse. There's also been a growing list of artists using the various Bugera amplifiers. From studio musicians to Blues, funk and rock, thrash and pop, there's a good mix of guitarists using this gear. Check out some reviews by industry magazines. Depending on the desired tone, there are different boutique-style combo and head/stack amplifiers available. These range in wattage from a 5-Watt Vox style combo to 120-Watt, three channel guitar amplifiers. I could drone on about the different models, but I'll just send you over to Bugera Amps to dig into the amplifier models. This should get you started if you're interested in checking out Bugera amplifiers. There are a lot of reviews coming out, many by music industry journalists for their respective print or web magazines. There's also a lot of comments in forums out there, not all of which are positive. Everyone's entitled to their opinions, but before you make a decision based on someone else's comments, find a local Bugera dealer and test one out for yourself. Or at least check out the many YouTube videos. I did, and I've been very pleased with my 333 rig. It's got great tone and is plenty loud with its 120 watts and 4x12 cabinet. Three channels (Clean, Crunch and Lead), reverb and a footwsitch make this a versatile amp for any gig. I just have to make sure I keep it down when the kids are trying to sleep!